I first heard of Protagonist when I visited Vanessa Traina's boutique called The Line. Protagonist is one of the lines that is carried at The Line. Ha! I was intrigued by the name and then found out it is right up my alley. Included are beautifully executed wardrobe staples defined by the subtleties of form, fit and fabrication. As a fashion/wardrobe stylist: form, fit and fabrication are key. Looks like Protagonist feels for a ski pant for Pre Fall. I agree it looks fresh again. Here's a nod (maybe more than a nod) to the new larger silhouette. More beautifully executed separates to keep in your wardrobe for years to come. 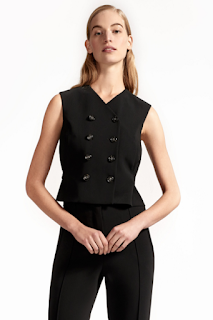 A spunky little vest gives a punch to the wardrobe. A cropped flare still looks fresh. If you want a beautifully made piece that will be a staple and one that you will have for years to come take a look at Protagonist. The name is easy to remember but may not be too easy to find yet. I know you can definitely find it at The Line in New York or LA.